Learn the Genius tips and tricks that will make your iPad even better - now updated for iPad Air 2 and iPad mini 3! iPad Portable Genius is a practical, easy to read guide to getting the most out of your iPad. Written in a clear, no-nonsense style, this full-color resource describes the tips and tricks you may not discover on your own. You'll find helpful information about the most commonly used features, along with techniques that can help you do better things faster. Genius icons throughout the text highlight smarter ways to get things done, and plenty of screenshots provide visual examples of the techniques described. With coverage of the latest iOS and the newer-generation iPad Air and iPad mini, this book is a handy reference for any iPad user. You've got the most coveted tablet on the market—don't you want to see what it can do? If you're only using your iPad for e-mail and the Internet, you haven't even scratched the surface. 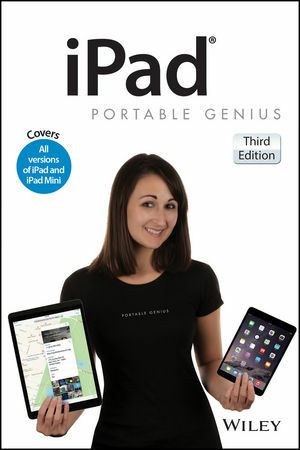 iPad Portable Genius is your handy guide to full iPad functionality. Paul McFedries has written more than 85 books that have sold four million copies worldwide, including iPhone Portable Genius and all previous editions of iPad Portable Genius. Paul encourages all readers to drop by his website at www.mcfedries.com.